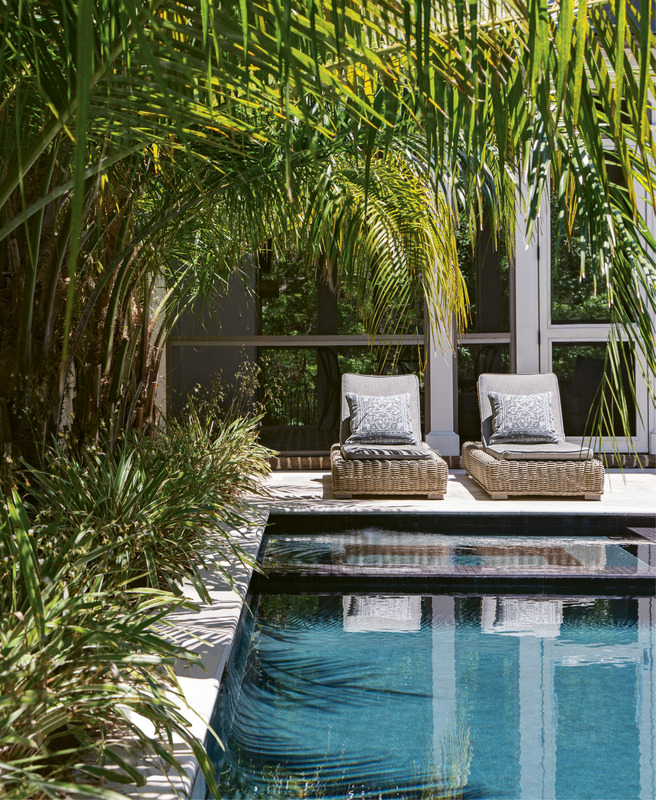 Reflective Pool: Though not initially in the plans, the Cuocos’ addition of a pool—a spot for relaxation, family fun, and outdoor entertaining—reflects their lifestyle and their wish that home be a place of refreshing serenity. 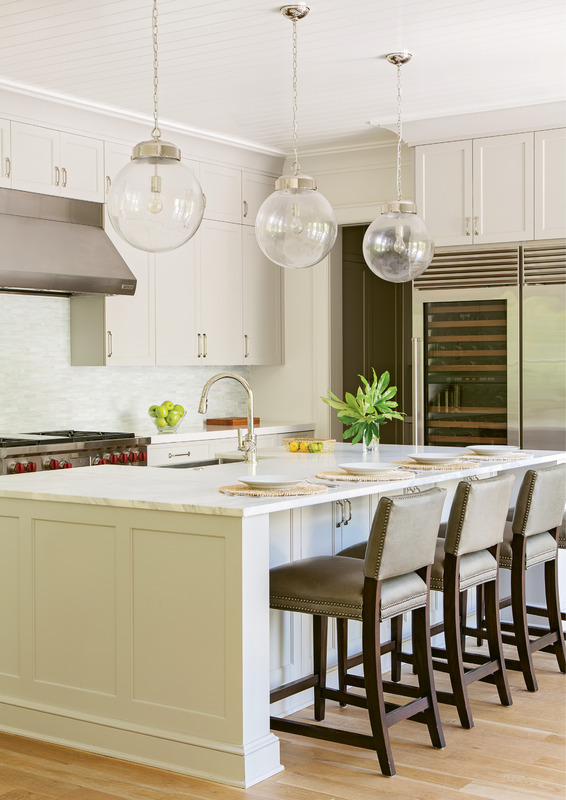 His passion for all things food and wine were the driving force behind the kitchen design, including his insistence on an “island that’s almost too big,” he says. Rusty, their mini Goldendoodle, blends in (adorably) with the unfinished white oak floors. Lap & Light: Shiplap walls throughout the main living and dining rooms give a “buttoned-up” feel to the casual décor, says Lenox. Loads of natural light energize the airy rooms, and a calming palette of soft greys adds a sophisticated feel. The family sits down nightly for dinner, “around the dining table; we’re kind of old-fashioned that way,” says Theresa. Island Living: The Calcutta gold marble island is the kitchen centerpiece and hub of family life, with kids coming and going from school and tennis practice and the two physicians coordinating busy schedules. 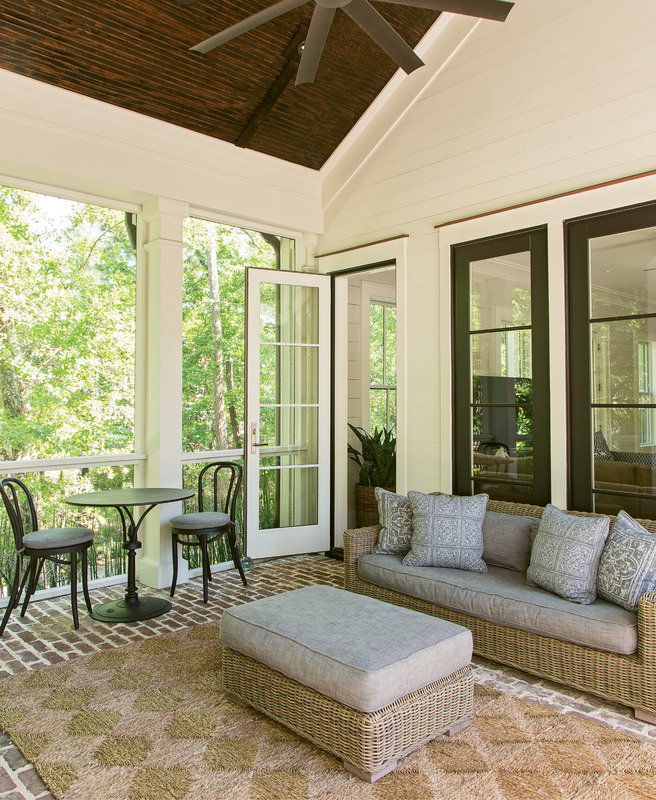 Porch Peace: A screened back porch off the main living room opens both to the house and the courtyard, extending the sense of “outdoor living,” says Lenox. 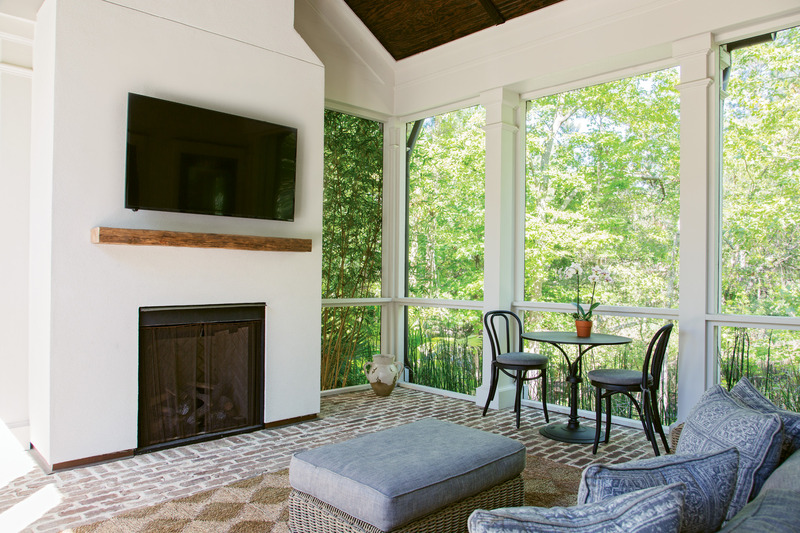 Old Savannah brick flooring adds earthy texture, and bamboo planted outdoors creates a natural screen. “It’s like you’re encapsulated in the Lowcountry,” Lenox adds. Dreamy Drama: “It’s my favorite thing in the house,” says Theresa of the big, dramatic light fixture in the master bedroom, a constellation of mini-globes reflecting light in dazzling gentleness. “Keeping the décor neutral and simple allows for going big and making statements with the light fixtures,” notes Lenox. Drawing a Bath: Frank and Lenox spent days redrawing the original plans for the master bath, which entailed moving the oversized walk-in shower to another wall, and perfecting the sight lines into the bath from the hallway and again into the adjoining dressing rooms. “I love the sculptural aspect of the tub, contrasted with the angularity of the pendant light,” says Lenox. Beware the unexpected knock on your door. Neighborly drop-bys are rare these days when it’s much easier to send a text. So, when a couple of real live people appeared on the front steps of Theresa and Frank Cuoco’s I’On abode a few years ago, little did they expect that the door would open to a design and lifestyle makeover, much less a brand-new home. Turns out, the visitors were the original designer of their Robert Mills Circle house and a client who came bearing an offer the Cuocos couldn’t refuse. 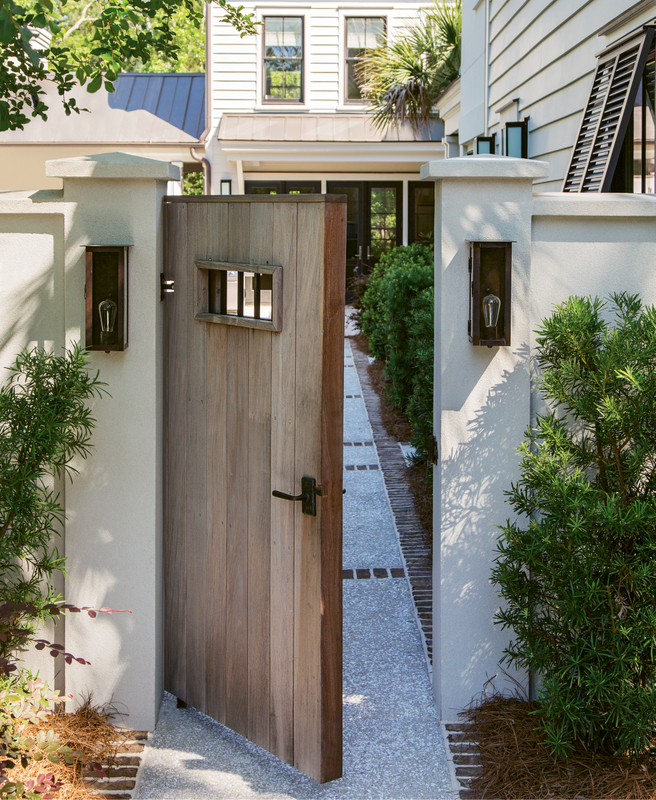 Four years prior, the couple, both physicians, had purchased the fairly traditional house with Charlestonesque mouldings after they had accepted positions at the Medical University—Theresa in internal medicine and Frank in cardiac electrophysiology. Settled in with their two children (Michaela, now 16, and Jacob, 12), they were not looking to move. “We liked our house and loved the neighborhood, but once we got the offer, we embraced the opportunity to create a home from the ground up that maybe was a bit better suited to who we are and how we live,” says Theresa. And it helped that the ground for that ground-up redo turned out to be an available lot directly across the street from them. “It sure made for easy and convenient construction monitoring,” she adds. ALKA Construction, a prominent builder in I’On, owned the lot and already had designs drawn and permitted for a “transitional” style home to be built there—i.e. one that’s decidedly not traditional but also not overly contemporary. Think Goldilocks “just right,” if Goldilocks had happened upon an upscale marsh-side manse rather than a bears’ hut. The couple asked Branko Damjanovic, ALKA owner and their I’On neighbor, and architect Joe Credle to make a few tweaks to the plans and then teamed up with designer Melissa Lenox to guide them. Frank took the lead as the primary design aficionado of the family, and Theresa gladly played second fiddle. “You guys do all the big-picture work, just bring me the last two or three options for colors and materials, and I’ll chime in,” she requested. The lot, which cozies up to the wooded marsh, was the selling point. “I love that you look back here and don’t see a single house,” Frank says. The couple’s goal was to “be true to the marshiness” and play up a natural, light-filled tranquility, explains Theresa. 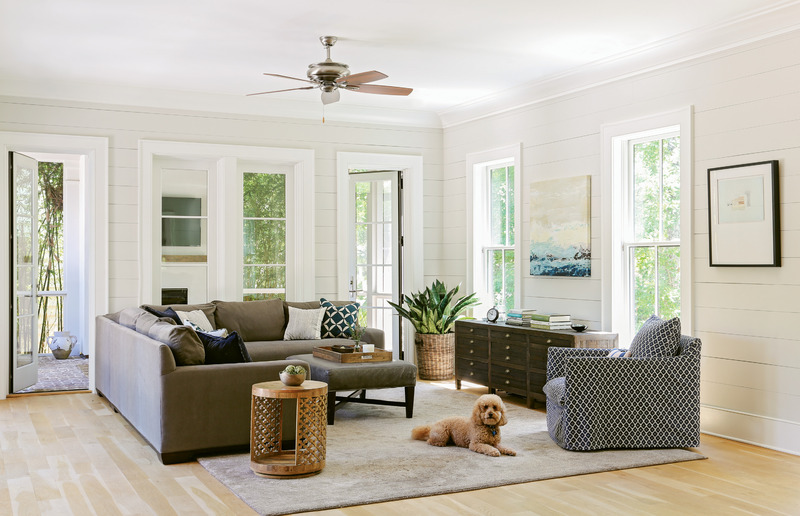 “We wanted it to be open-air, to feel almost like you’re sitting on the marsh when you’re inside.” Lenox obliged with a palette of soft greys throughout the home, lending a sense of “peace and calm.” Shiplap walls add texture and a “pseudo-beachy feel” to the streamlined ambiance, plus, “they’re easy to wipe down,” notes Lenox. The serene vibe is amplified by a minimalist approach to furnishings and a less-is-more philosophy on the bare, unfinished white-oak floors—not to mention the Cuocos’ impressive lack of clutter. Anywhere. Kitchen counters are clear; coffee tables are sparsely populated; there are no stacks of mail or kids’ school-or-sports detritus tucked in corners. Even the vanity in Theresa’s dressing room is lipstick-free. “I really don’t have a lot of stuff,” she confesses. Plus, Lenox guided them in thinking through storage needs and efficient use of space. Custom built-ins in the office, a butler’s pantry with a secondary fridge and floor-to-ceiling cabinets, two laundry rooms (one up and one down), and a mudroom off the garage all help contain the paraphernalia of an active family of two tennis-playing teens and two busy, working parents. But don’t let the lack of kitchen counter accouterments fool you—the hub of the house gets a regular workout. “Cuoco means ‘cook’ in Italian,” declares Frank, the family’s chef, who garnered culinary tips from his Italian mom and from working in restaurants including Galileo during med school at Georgetown University. The kitchen’s centerpiece slab of Calcutta gold marble, the largest they could find, was one of Frank’s absolute requirements. The rest of the kitchen was designed around the other must-have: the wine fridge. 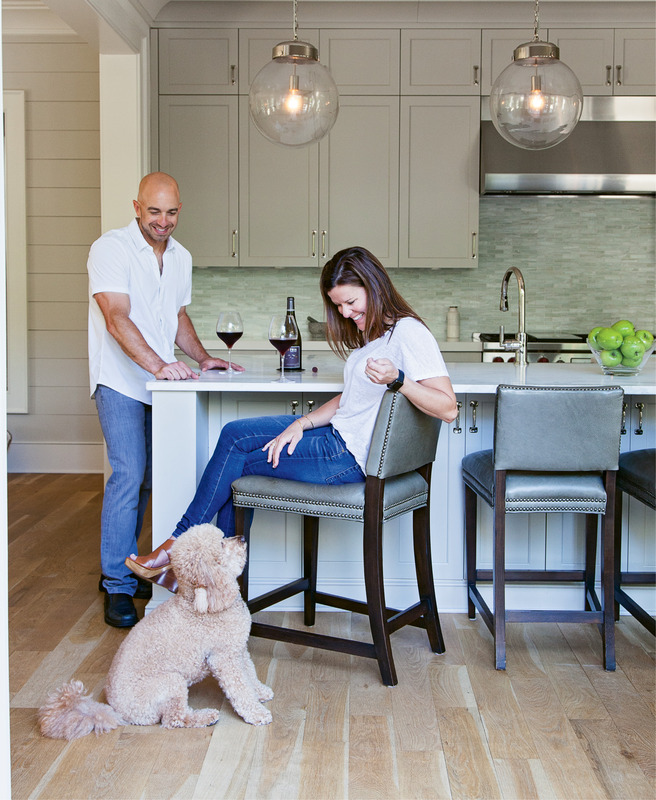 “At first we thought about having a separate wine room (where the pantry is now), but nobody’s going to sit in a dark room to drink wine,” he says. With its bank of windows and glass doors looking out onto the courtyard, the kitchen and adjacent dining/living room are anything but dark. Sunlight pours in, which delights Rusty, the family’s mini Goldendoodle, who has a front-row seat for watching poolside action. “The courtyard was already in the plans, but not a pool. We added it, and it’s the best thing we did,” says Theresa. Lenox loves how the rectangular pool serves as a focal point from the entryway through most of the house—due to all the windows—but the family loves it mostly because it’s fun. 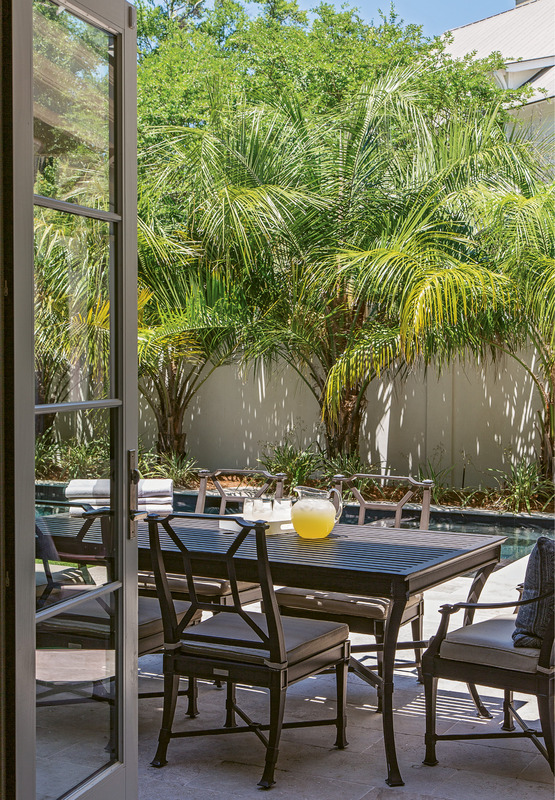 A screened porch, complete with a gas fireplace and wide-screen TV, opens off the family room and the courtyard, further extending the family’s poolside indoor/outdoor living and entertaining space. From top to bottom, Lenox procured all the artwork (save one piece in the dining room that they loved from their former digs) furniture, and lighting specifically for this home. “That house was more classic, more traditional, kind of like the house I grew up in,” says Theresa. 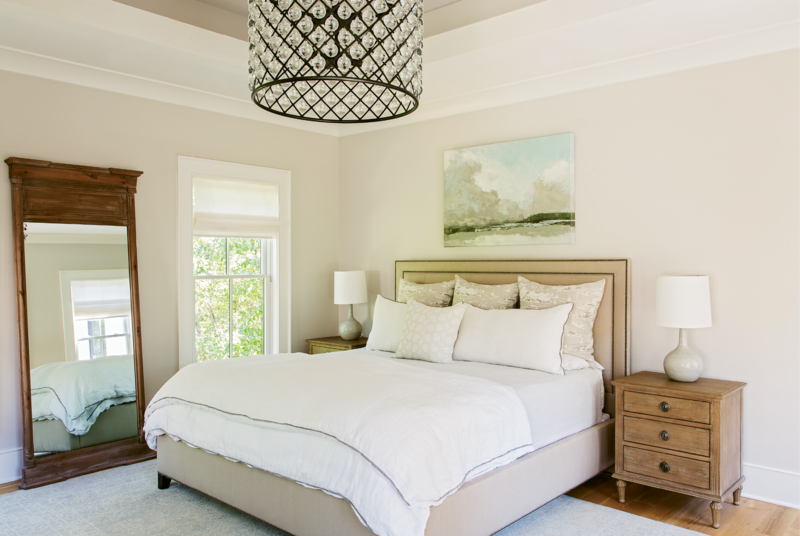 “We decided it was time for a whole new feel, to sell everything and clean-slate it.” The light fixtures in the upstairs hallway, and especially a globes-in-globe piece in the master bedroom—extra big “to amp up the drama”—are her favorite elements. “They throw off such pretty patterns at night,” she says. And while Frank was the initial front man for all things design and décor, daughter Michaela has gotten into the action recently. For her last birthday, she asked for a bedroom makeover, in lieu of a “Sweet 16” party. “Of course, what started out as maybe some new sheets and new bedspread turned into a whole vibe change,” says Mom. One thing that didn’t change, though, was the parents’ no-TV-in the bedrooms policy, including in the master. This active family hardly has time for television anyway. The kids, when not studying or practicing serves and backhand returns, are enjoying their pool and neighborhood, and Mom and Dad, when not treating patients and teaching medical students at MUSC, are cooking, entertaining, exercising, and enjoying the serene oasis of their home. Which is a good thing. It means the Cuocos are prepared, because you never know who could come knocking. ■ Choose simple, soft colors. Greys tend to be peaceful and calming. ■ Go flat. 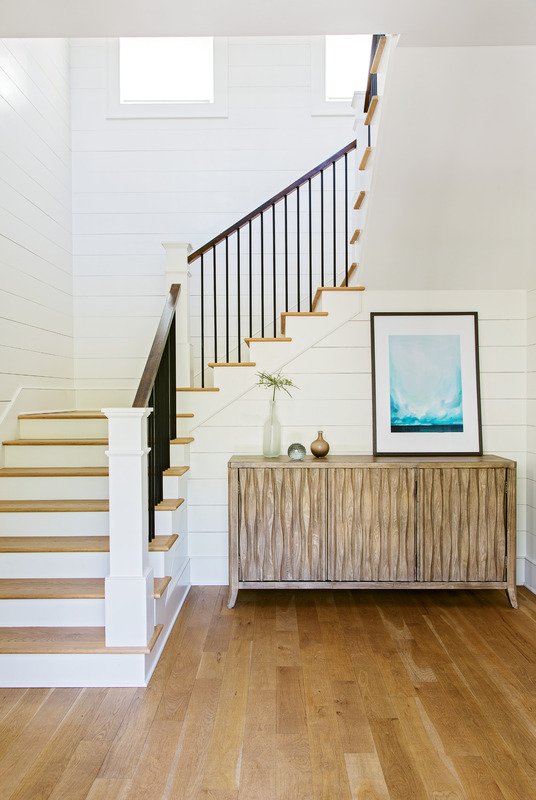 To make the rooms feel more casual and understated but still buttoned-up, we painted all the shiplap in a flat finish, except for the hallways where semi-gloss is a bit more durable. ■ Do something a little different in every room. The kitchen is the only downstairs main room not to have shiplap, but it features a beadboard ceiling to set it apart. ■ Get organized. The mudroom helps cut down on things that usually end up in the kitchen or strung throughout the house. Everyone has a cubby, and they’re utilized daily. The family generally enters through the garage, so at the point of entry they can drop everything and put it away! ■ Shine a light on lighting. To honor the serene feel, I chose under-stated fixtures, but we amped up the scale a bit. The kitchen island pendants are simple yet dramatic in size, as is the dining room drum pendant. The master bath light over the tub is one of my favorites—its angularity offsets the sculptural lines of the tub. ■ Turn long hallways into assets. Because the house is L-shaped, there are long hallways leading you through. All of them have lots of windows, so we took advantage of the natural light and placed interesting art at the ends in the lines of sight. We chose textural light fixtures that add a warm glow at night, throwing off a twilight effect. It’s pretty swanky and romantic.